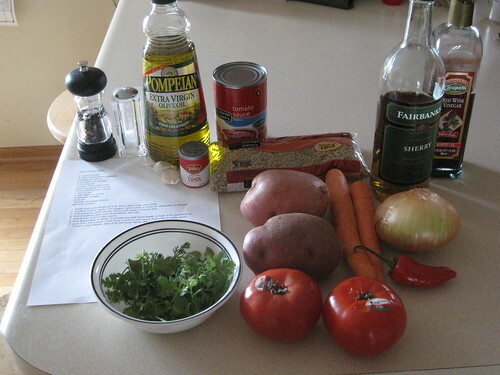 In April and May, National Public Radio featured a series on inexpensive gourmet dishes entitled How Low Can You Go?” Although many of the dishes looked quite tasty, most of the dishes weren’t actually all that inexpensive, often narrowly getting below $10 to feed a family of four, and many involved arduous cooking processes. 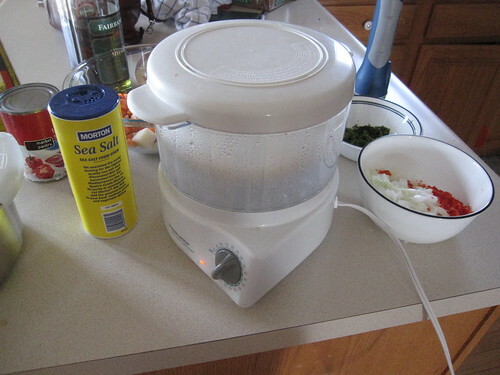 I decided to try out some of these recipes throughout the summer to see how I could take the recipes and reduce them down to a simple and very inexpensive form. 6. Salt and pepper to taste. (I sometimes add more water or beer if it’s too thick, or vinegar if it’s too sweet.) Add more cumin or hot sauce if you like it really spicy. 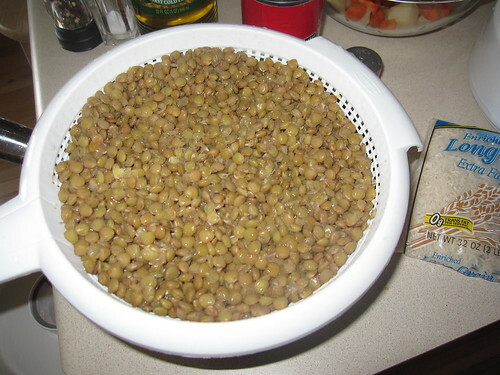 One immediate problem I observed is that the “three cups of lentils” likely refers to three cups of lentils after boiling, which means that 1 1/2 to 2 cups of dry lentils should be more than adequate for this recipe. 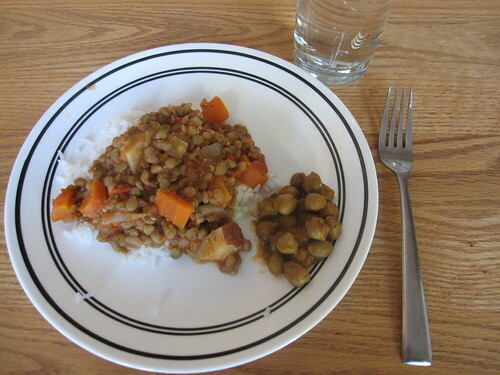 Three cups of dry lentils would make this recipe mostly flavored lentils with a few other pieces thrown in. While the lentils are boiling, you’re going to be spending that time chopping vegetables – again, something you can do a day or two in advance. The potatoes, carrots, tomatoes, onion, and garlic all need to be chopped. We use a special knife called an ulu to make this process easier. 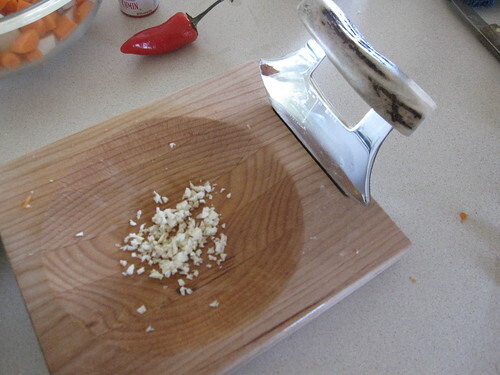 An ulu is an all-purpose knife used by the Inuit for many different purposes, but it works really well for quickly chopping small amounts of vegetables. You simply grasp it by the handle and rock it back and forth on a cutting board with the vegetables underneath. Of course, you can use pretty much any knife to chop vegetables – this is just a recipe where the ulu really comes in handy. 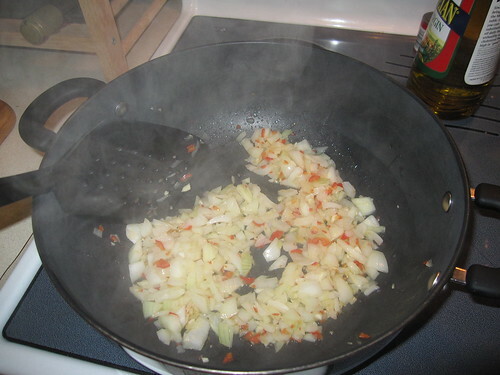 Next, I sauteed the onions, garlic, pepper, and cumin together, with about two tablespoons of white sherry. The same amount of a mild beer would be fine. Next, add the potatoes and carrots, then add enough water to cover everything, then raise it to a boil. 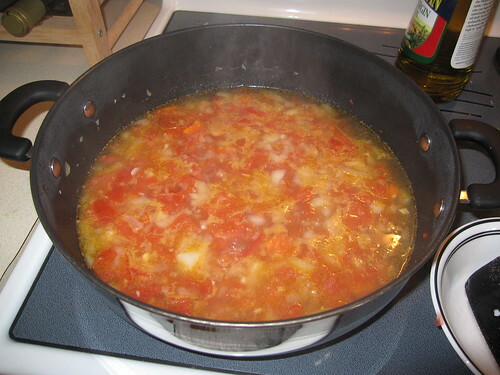 Once the water is boiling, add the tomatoes and then let it boil for ten minutes or so. Check a piece of potato and see whether it’s soft enough for your tastes – if it isn’t, let it boil for another five minutes and check again. Once the potatoes are finished, it’s basically done. Just add the tomato sauce and the lentils, stir it a bit, season with some salt and pepper, and serve it! You might also want to have something else on the side. We had a very simple chickpea curry – basically just chickpeas (garbanzo beans) loaded up with curry paste. Yes, we love our chickpeas at the Hamm household! This made a huge amount of dal. We had enough for our dinner that night, lunch the following day, and lunch two days after that for all four of us, and we still wound up freezing some of it. Did we like it? All of us liked it quite a bit. Sarah perhaps liked it the least, particularly on reheating, and strongly suggested trimming the amount of cilantro, which I agreed with. It was delicious, though, and I was happy eating it even the third time. Our total cost (ignoring fractional items we had on hand): $8.29, almost entirely on fresh vegetables. Given the amount we made, though, the cost per meal was $0.69 – pretty nice! First of all, I’d trim the entire recipe by half. This made far too much food for us as is. Without some significant changes, you’ll either be freezing it – not a great option, since the texture will be ruined – or eating it all the time for days. Second, I’d cut the remaining cilantro by half – and use dried cilantro. Fresh cilantro has a stronger flavor, but dried will work fine. Third, I’d chop the vegetables and boil the lentils the night before. Turn on a radio in the kitchen and take care of these tasks in the evening so you can toss the meal together very easily when you arrive home from work the next day. 1. Chop potato, carrot, tomatoes, pepper, onion, garlic, and cilantro. 2. Soak and cook lentils till soft. Drain and rinse, set aside. 1. Sautee onions, garlic, hot pepper, and cumin in olive oil. Add beer or sherry. 2. Add vinegar, potatoes, and carrots, cover with water, bring to boil. 3. Add tomatoes and cook till potatoes are soft. 4. Add lentils and tomato sauce. 5. Salt and pepper to taste. Add more water or beer if it’s too dry, or add hot sauce if you like it spicier. 6. Throw in the cilantro, take if off the heat. Serve after a few minutes.